Having a pipe table in your home decor is all the rage now. I have to admit: I’m in love with pipe tables! They are easy to make and they fit in most rustic, Southwest, Indonesian and Boho decor. You can use scrap wood, an entire slice of a tree, a board or several boards for the top. The legs can be done with skinny pipes, thick pipes, crossed pipes and even copper pipes! You can spray paint the legs and have them ready to stand with a twist (pun intended)! 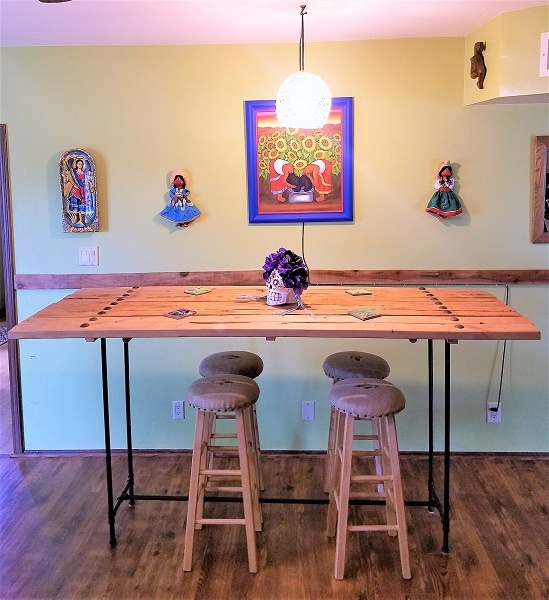 If you are following this blog you know I have been decorating my Mexican-inspired bar (here and photo below). I had this area where I wanted to put some tables to make it look like a real bar: I pictured friends sitting in different tables and chatting in groups during parties. More importantly, it had to be cool. No dingy basement-looking-man- cave. Especially, inside the house! The space was not that big and I wasn’t sure I could find something that would work in the space and still match the decor. Price was a consideration when buying more than one table too. Then I thought maybe I can install a shelf instead. But then shelf seemed a little concerning because what if the wall wouldn’t hold the weight? The wall was mainly drywall and even if I nailed the shelf to the studs there was still a possibility the shelf would eventually sag with people putting weight on it and such. Plus, I think a shelf would look a little “meh” for the space. I had already made a pipe table using a patio umbrella stand I found in my backyard (the process: here and pic on the left). Making that table was very easy and It looked so cool! It didn’t take long for me to realize that I could make another table like that. A custom made table would fit the space and certainly, it would match the decor. The table would have the size I wanted, the color I wanted. The only consideration was that I needed to make the table stable enough since the legs would have to be made with 1-inch pipe and I didn’t want it to be wobbly. I opted for the one-inch pipe legs because thick legs would make the decor a little too heavy. We already had too much of that. I decided to make a long table instead of two square ones (8ft). The table would be narrow enough not to clutter the space and also light enough that it could be pushed against the wall when not in use (20in). As usual, I went to the home improvement store and went straight to the rejected pile. I wanted the knots, the dings, the personality. These boards were cheap! $0.96 each!!! Of course, the pipes were a little more money but if you go to the electrical section of the store you will find out that they are the same as the plumbing department but a LOT cheaper. Of course, they are this ugly galvanized pipe color and they are covered in grease (YUK!). The first thing you will want to do is wash them with soap and water. Then rub vinegar afterward or the spray paint may not attach to the pipe. Assembling is just like a Puzzle! Once cleaned, I assembled the legs according to my measurements (height 43in, length 8ft, width 20in) to fit my space. Notice that I opted to add a crossbar at the bottom so the legs would be stable at the base. The flanges would provide stability at the top. Instead of end caps you can use flanges too. It would be cool but they are soooo expensive! These were already 4 bucks each. Imagine using 8! With the price of the 4 flanges I didn’t buy I was able to buy most of the short pipes and “T’s”. Crazy, no?! I spray-painted the legs to match the color of the other bar height table I made (here). Next, it was time to assemble the top. Very easy: Line up the boards and screw three separate boards under the table to join them together. Then it was just a matter of screwing the flanges onto the top and voila! Make sure to use screws that are short enough not to go through the other side of the board. After the table was assembled I just stained in the same color I used on the other table and let it dry (a mix of cherry and light oak color – let me know if you want the exact names). After the stain was dried I added large nailheads I found on Amazon. I was so proud of myself. A friend of mine came to visit and commented that it was a nice table but he wished it was wider so our friends could play cards on it- “SSSSSSSS” (sound of a balloon deflating). According to him, people would be able to see each other’s cards if they sat around the narrow table. SIGH! I didn’t have the space to make it wider. The solution? Wings!!!! Adding wings would allow the table to remain narrow and not clutter the space but still be available when game night was on. The concern was that with a top that heavy how was I going to add more to it and still hold the weight of the wings when opened, and be stable? After reviewing all options I opted for hinges and brackets under the table to hold a dowel on each end that would serve as support for the wings. It was simple and easy and didn’t require a lot of mechanics or expensive hardware (I saw hardware for as much as $25 dollars each- I would have needed four!). The whole table didn’t cost that much to make. So dowels it was! Assembling the wings was the same as the table top. Line them up, screw boards under and done. Then I attached the hinges on each side of the table and the side of the wings. I attached the brackets under the table but I had to smash the brackets a little so the dowels would not slide too easy and pinch someone in the process. I think it looks good. My friend approved the design and my husband already used it several times for game night. For this and more projects follow us on Facebook and Pinterest. Don’t forget to sign up for our email list below so you can get news and updates directly into your inbox. As a thank you for signing up, you will receive a project budget worksheet so you can take charge of your project and never exceed your budget. I’m sure you do it. We all do it. We like to save trash! We have patio sets, tables, planters and other items that we just don’t want/like anymore. But we just can’t make ourselves trash them. When I moved into this house there was a lot of stuff left in the backyard that was in pretty good shape. But either the items had the wrong color or were rusted or beat up. One example was two patio tables. These were cheapie glass tables that were rusted and were painted white. Most people would consider that trash. I saw an opportunity. We were lucky the previous owners left all their real iron patio furniture (the type we could never afford-See the chairs?). Of course, they took the nice tables including a hammered copper table that alone was worth over $2000 bucks! Well, I would have taken them too. So when you find stuff that has good bones but the color isn’t right, what does a girl do? Spray paint! Good old flat black paint and trash was turned into gold, er, new black tables. Good as new and matched everything (sorry, no before pics but you get the idea)! Well, like I said, that was an example. What I REALLY want to show you is how I got something from the backyard and turned it into a show piece in my home bar. There are many projects surrounding that bar but this was one of the most fun to do. The previous owners also left three heavy umbrella stands. Two of them had these nice decorative “sworlies” on the base and I always thought it was a shame that they were sitting there unused. Our patio is covered and we don’t really have a need for umbrellas. Except for the goose pond: they sure need shade when it’s 200 degrees outside in Arizona. One day I was looking online for ideas for bar height tables for my home bar. I didn’t want to spend a lot of money and I noticed that most bar height tables with the style I needed were a little bit pricey. Also, the room was not that big so I would need custom pieces that would not only fit the space but also the needs of the house (i.e. husband’s game day needs). More money. So when I found pins about pipe tables I thought: Jackpot! How cool are they? 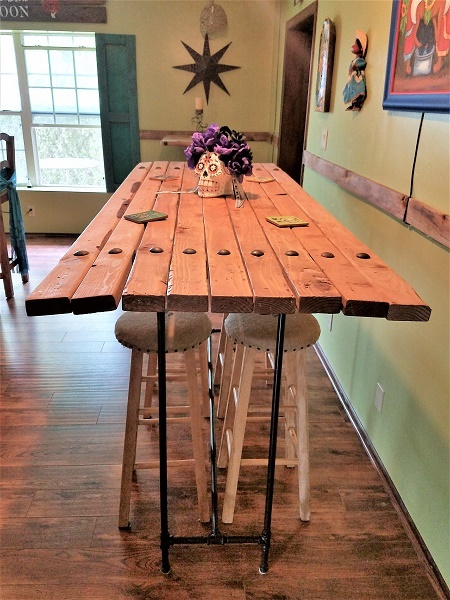 Easy to assemble, industrial chic/rustic. I had to have one…er, or two. I wanted to make a smaller table for one of the corners of the home bar room. That table would be a small square that could fit up to 4 people when pulled out of the wall. I wanted it to match another pipe table I made for the same room. But if I made it small and square, the legs would have looked strange if they matched the ones on my first pipe table project. I just couldn’t figure out how to make the base stable. You can see where this is going. I was just out of ideas. Until I went to check on the geese one afternoon and there it was: My table base! 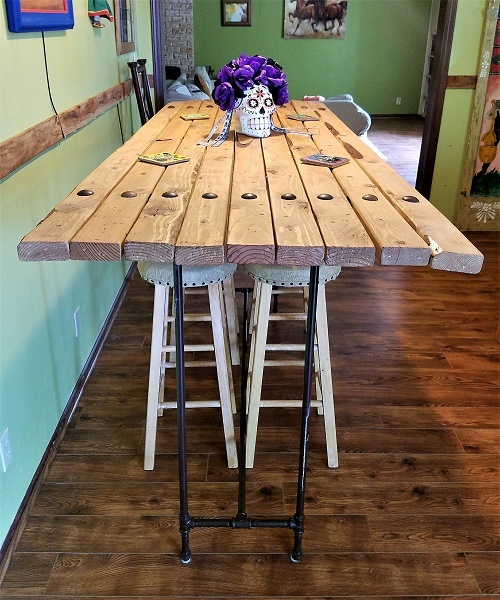 I used new wood boards for my table top and I personally distressed them by hammering, stomping, and using other tools to give it a “worn” look. But you can use left over wood from your backyard. Or even barn wood from a salvage place. The sky is the limit! Putting the table top together was very easy. I just lined the boards together and screwed two boards to the back of the table (see image left) to brace top together. Then it was time to connect the flange holding the pipe base to the table top. I decided to use hex head screws to give it an industrial look to it. spray painted them before attaching them so they would match the “future” nailheads I was planning to add to the piece. I know, I know, the screw could have been shorter but it was all I had and I was too lazy to buy more or cut them short. Plus no one would reach that far with their knees anyway! Be sure to spray paint the screws before attaching them. I love how the color turned out as the screws matched the decorative nailheads perfectly. Here’s the final product! What do you think? So cool to be able to use left over stuff to make new things. The whole thing cost me just the pipe and the flange. I had left over 2×6 boards already. I paid no more $20 bucks for the pipe and the flange. The flange is the most costly piece of the whole thing (if you are not buying a new umbrella stand to do this). The secret for a cheaper pipe is to get pipes from the electrical department, not plumbing. They are of equal quality but electrical pipes are much cheaper for some reason. Some places will even thread them for you for almost nothing or free. The one I bought was already threaded and I only needed threads on one end for the flange because the other end was just going into the umbrella base. Even cooler is the fact that you see some of these pipe tables for sale for a FORTUNE! This table, for example, would easily cost about $300-500 bucks. Not a bad return for $20 bucks, right? Do you have any variations of backyard finds that you transformed? We would like to see them. Join us next time for more projects around the house. Follow us on Facebook and Pinterest for new project ideas and don’t forget to sign up for our email list below for news and updates!